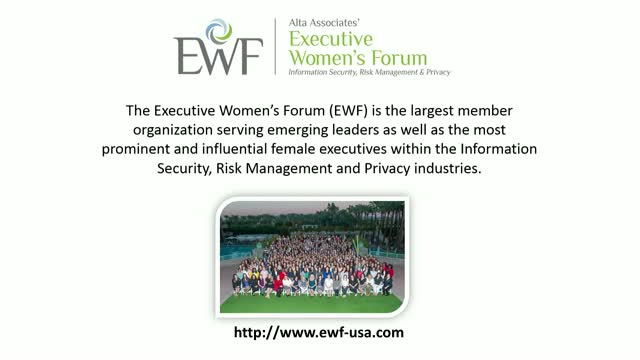 The Executive Women's Forum on Information Security, Risk Management & Privacy is the largest member organization serving emerging leaders as well as the most prominent and influential female executives in the Information Security, Risk Management and Privacy industries. Secure messaging is nothing new. During WWII, Winston Churchill required a secure channel to speak to Franklin D. Roosevelt. In today's business and geopolitical environments, it’s more than world leaders who require it. Join Dr. Galina Datskovsky for a fireside chat and explore the trends, risks and threat factors that make secure communications such a compelling and timely topic for healthcare, financial services, energy, government, consumers and more. Dr. Galina Datskovsky, CRM, FAI and serial entrepreneur is an internationally recognized information governance, privacy, compliance, security and artificial intelligence expert. Galina is currently the CEO of Vaporstream®, a position where she applies her knowledge and strategic guidance in building businesses, product development, governance policies, as well as cybersecurity. Prior to Vaporstream, Galina held the position of Senior Vice President of Information Governance at Autonomy/HP; in addition she was General Manager of the Information Governance Business Unit and Senior Vice President of Architecture while at CA Technologies. She joined CA in 2006 with the acquisition of MDY Group International, where she was founder and CEO. Currently, Galina sits on the advisory board of the Executive Woman’s Forum and is also part of the Voice Privacy Alliance. She is a champion of the entrepreneurial spirit as she has served on the board of multiple startups assisting with strategy, and continues to support the startup community. Galina served as Chair, President, President Elect and Director of ARMA International (2007-2013) and has been widely published in academic journals, speaking frequently for industry organizations worldwide. GDPR’s enforcement date begins May 25th – a day after this webinar. Is your organization ready? What if you are just getting budget for GDPR compliance efforts. What if you just learned about the GDPR and your organization is subject to this law. If any of these scenarios apply, this is the webinar for you! Crawl out from underneath your desk, uncurl from the fetal position, and join us for a Executive Women’s Forum webinar on May 24th. After 25 years of speaking and writing about the impacts of technologies on “the human in the machine,” Richard Thieme documented the traumatic consequences for security and intelligence professionals of swimming in dark and turbulent waters that challenged our abilities, our ethos, and sometimes our very identity. Who we thought we were came up against what we had to do and the friction threw off sparks. This webinar goes beyond those stories to explore in particular how what dominant cultures call “minorities” manage their unique challenges. Thieme has uncharacteristically lived as “a minority” in five different ways and the dynamics and resultant strategies he had learned port seamlessly to the experience of others. There’s more to it than “playing through the pain” - there’s real gold in discovering our capacities for the resilience, power, and self-transcendence intrinsic to the human condition. Beginning with the “real facts” of the matter, Thieme draws on his experience to suggest ways to make this game a long distance run, not a sprint, and not lose our selves along the way. Cybersecurity investment has gone through the roof in recent years. Yet, there is a global shortage of qualified professionals to fill a growing number of open cybersecurity roles. According to a recent study by Frost & Sullivan, the global cybersecurity workforce will be short by around 1.8 million people by 2022. How do organizations cope with the growing demand for security professionals, especially in an age of ever-expanding attack surface and more frequent and sophisticated cyber attacks? Watch this live video panel of experts as they discuss the current trends shaping the cybersecurity industry, the need for diversity and inclusion, and strategies enterprises can employ to stay ahead of the game.